We know that the Ancient Romans had topiary from the written works of Pliny the Elder at the time of the Emperor Augustus although it may well have preceded that. By the end of the First Century AD it was popular in the gardens of the wealthy and if you go to Pompeii, near Naples then you will see that the garden of the House of the Vettii has been restored with clipped box planted in the same spots as where roots where found of the originals after the eruption of Mount Vesuvius in AD 79. It spread throughout the Empire as Roman colonists took with them the tools and skills of their trade partly to make the new lands feel like home but partly to announce that civilisation had arrived. 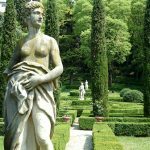 Like most fashions topiary ebbed and flowed but it was during the Renaissance with a rebirth of all things ancient that it became to dominate Italian gardening and establish a style in the minds of gardeners ever since known as, not surprisingly, the Italian Style. 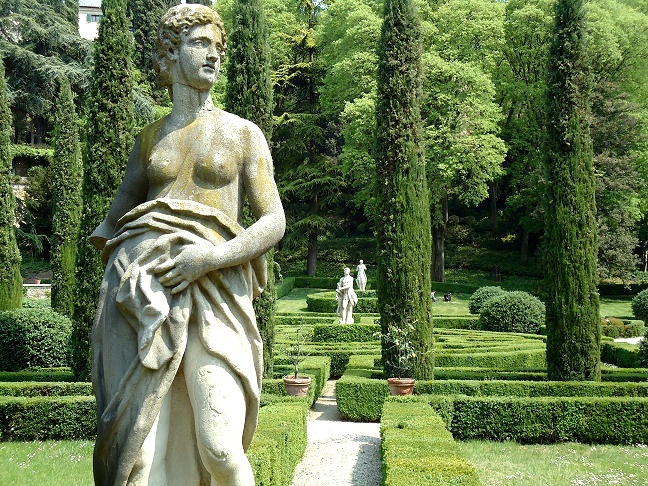 This style became the template for many other gardens in Europe and later beyond for several centuries. Clipped herbs and shrubs were used to make geometric patterns and there was much use of statement planting in pots. Mazes also became popular originally thought to be based on a religious Christian zeal but in most cases as places of fun, challenge or sexual assignation. Water was also popular in combination. By the time of the Baroque in the Seventeenth Century Italian gardens had grown even more elaborate with mythical grottoes and fantastical water features which required hydrological engineering as well as horticultural skill. Box began to be used again as there was a generally held opinion in Europe before that time that it had an unpleasant smell.